Visit the Photo-Sonics Video Gallery to view Cine-Sextant videos. The Cine-Sextant utilizes three custom, direct-drive torque motors: one 1800 foot-pound torque motor in the azimuth axis and two 550 foot-pound motors providing 1100 foot pounds of torque in the elevation axis. This high level of torque is provided to maintain maximum dynamic tracking accuracy and performance with heavy or unbalanced payloads. Four motorized jacks provide a wide footprint for a stable tracking base. All major structural members including the base casting, azimuth carriage, and instrumentation platforms are cast of high strength aluminum alloy. The attachment hardware on the trailer is provided for lifting the system by crane or helicopter. The Cine-Sextant is offered in both a man-in-the-mount and/or an unmanned configuration with complete remote control operation. 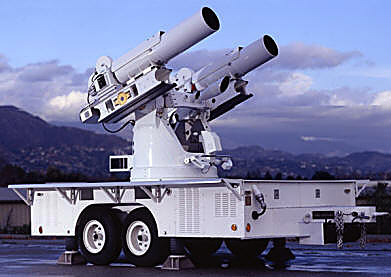 In the unmanned configuration the customer has the option of configuring a center platform for mounting additional payload such as a 34” aperture telescope and sensor suite. ● Comprehensive pre-flight preparation and calibration. Includes built-in tests. Tongue Weight - 1,000 lbs. Total peak power 7.5 KVA providing 1,800 ft. lbs. azimuth torque and 750 ft. The Photo-Sonics Mobile and Fixed-Site Cine-Sextant tracking systems provide smooth, high-dynamic performance TSPI tracking of a target anywhere in the celestial hemisphere that begins 8 degrees below the horizontal. The Cine-Sextant serves as a support system mounting of cameras or any electro-optical devices used in target tracking and data acquisition. 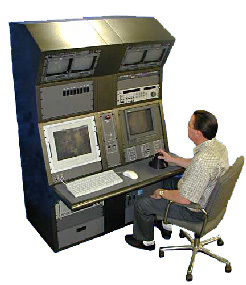 This mount requires only one man for set-up, alignment and operation. Its four platform mounting surfaces can carry up to 250 pounds each with no loss in performance. The basic design requirements of the tracking mount are the same in both mobile and fixed installation systems. The tracking mount consists of a base assembly that contains three leveling screws, azimuth drive motor, tape cables, and azimuth carriage assembly. The azimuth carriage carries the control stick and the operator seat, and also supports the elevation axis assembly, comprised of the elevation drive motors and the elevation payload carrying platforms. Encoders of any desired accuracy up to 23 bits can be incorporated. Complete power and control systems are located in the trailer of the mobile unit; in the fixed site installation, a separate control console is located adjacent to the mount. In this configuration, a working platform is erected around the tracking mount, whereas in the mobile version, this is naturally provided by the trailer deck. 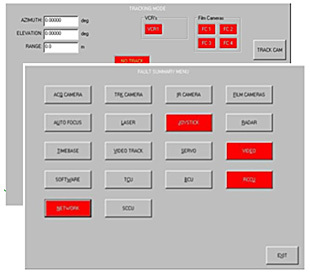 Control Software — The ARGUS control software provides all the functionality the user would expect of an advanced TSPI tracking system. It provides a single interface for the tracking pedestal, sensors, auto-tracking, radar, calibration, target simulation and diagnostics of the complete tracking system. Control of the system is simplified via an intuitive touch screen GUI. The standard ARGUS application can control up to 10 sensor stations, in addition to radar and lasers, allowing a single-operator complete control of all aspects of a complex and highly capable system from a remote location. It also provides the control of single and dual-gate auto trackers and fixed focal length and zoom lenses and focus tables. Automated Star Calibration are incorporated to yield the highest TSPI accuracy of any optical tracking system manufactured today. Visit the ARGUS software page. If you do not currently own an old style Cine-Sextant, please let us know and we will provide a unit for refurbishment. ● Replaces the hydraulic elevation actuators with direct-drive DC torque motors. power amplifier integrated into a single package. acquisition aid with lighted lines. ● Replaces old style elevation tachometer with new style, making it a more reliable system. ● Higher performance and bandwidth resulting from new style pulse-width modulated electronics. ● Dumping capabilities to determine systematic accuracies. ● Higher reliability with the removal of the hydraulics. ● No non-linearity's associated with the hydraulic system. ● No elevation stiction inherent with elevation actuators. ● No leakage associated with the hydraulic equipment.